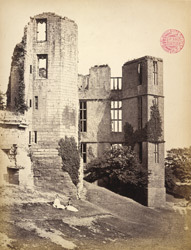 View of Gaunt's Tower and Leicester's Building at Kenilworth Castle in Warwickshire. Founded in the 12th century, Kenilworth is the largest castle ruin in England and was one of the country's most magnificent noble residences. From 1361 until 1399 it was held by John of Gaunt, the fourth son of King Edward III, who began the process of turning it into a palatial medieval residence. On the west side of the site he erected the Great Hall, a space for banquets and assemblies, and another grand chamber, the White Hall. Linked to these was the square external tower known as Gaunt’s Tower, seen in this photograph on the left. On the right is Leicester’s Building, erected by Robert Dudley, Earl of Leicester. After John of Gaunt’s time, ownership of the castle passed to the Crown and it remained a royal residence until Queen Elizabeth I gave it to Leicester in 1563. A favourite of Elizabeth, he transformed the medieval castle into a 16th-century palace which became the setting for a celebrated royal visit in 1575, when the Queen was entertained with spectacular pageantry for 19 days. He built a new gatehouse, a Tudor pleasure garden, and the range of lodgings known as Leicester’s Building between the old Norman keep and the medieval hall and chambers.